VUB: Applied Sciences: Department of Mechanical Engineering: Why the name Lucy? Lucy is the dubbed name for a skeleton of an Australopithecus afarensis found in Hadar, Ethiopia (1974). Although she was classified as an ape, not a human, she had some surprisingly human characteristics. 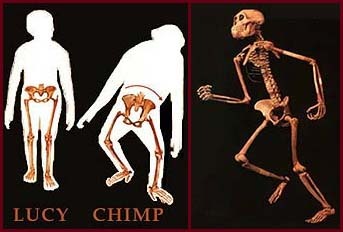 The way the hip joint and pelvis articulates indicates that �Lucy� was the first to walk upright like a human, not like a chimp. The find was of a 40% intact hominid skeleton comprising 52 bones, including the pelvis and femur. This gave us a picture of nearly every part of Lucy's body. 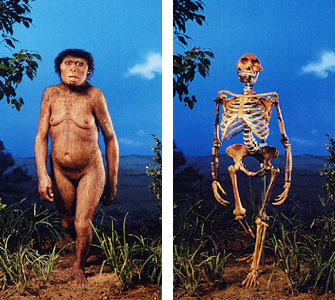 Lucy was about 100 cm tall, and from the shape of the pelvis she was a female. From the wear on her third molar, she is thought to have been equivalent to a modern human of around 25 to 30 years of age. Her cranial capacity was about 400cm�, nearly the same as a chimpanzee. Lucy got her cute name shortly after she was discovered. The camp was in an uproar at this hugely important, unforeseen discovery; at that time, a Beatles song was being played on the camp's tape recorder: "Lucy in the Sky with Diamonds." That is where Lucy gets her name.